Other posts by Katie Miranda. I agree brilliant, yes , although it could be more accurate: Radioactive Depleted Uranium Weapons have been used by Israel and the US in addition to White Phosphorous. Obama was not sworn in until Jan 20, 2009, two days after the operation ended. Exactly how could he do anything about Cast Lead if he had not been sworn in yet as President? Bush was still the acting pResident at the time. Obama had plenty of clout by then, as the president-elect. And he chose to say “there is only one president at a time”, didn’t he? and remember the DU that has deformed so many people today in Falluja and Hajaf, Iraq. And that was swept under the rug, after the US promised new hospitols and treatment programs for children with 6 fingers and extra limbs. To use nuclear laced weapons in 2003 reached new levels of war crimes. There were reports Obama operatives wanted any Israeli attack on Gaza out of the way before O entered the White House. Absolutely purrfect~ leave it to a cat! They have good old- fashioned and exquisite disdain for those they cannot trust. Just look at this cat’s angry eyes, frown and set jaw. Not happy at all. Thanks Katie! Grumpy Cat lives with the moggy version of dwarfism. It distorts her face. Grumpy Cat is one of my favourite internet characters. I share her outlook on life, the universe, and everything. ‘Ave you not met Henri, the fine feline philosophe? A French cat is hardly likely to be a philosopher worth listening to. Now now, RoHa! He’s no more French than Obama. His thoughts are voiced in French, perhaps taking the proverbial out of your least fave ‘philosophers’? Where did you get 9% from? I saw 40%. 25 percent said that they support intervention if Assad uses chemical weapons. I say strangely because the United States announced way back in June that it believed Assad had done exactly this. A large share of people who answered that the United States should intervene if Assad uses chemical weapons are apparently unaware that this line has already been crossed. and the chances all or even most of those 25% believe the line has already been crossed is exactly zilch. this kind of editorializing is really unhelpful. as if american on the internet can’t read the foreign press much less homegrown critics who doubt israel’s intel. kerry’s words, “our intelligence community” … my A**! there’s nothing “our” about it. I think that the 9% comes from the first recent Reuters-Ipsos poll, though a second poll, now about 3 days old, showed 20%. From memory! I think the Reuters commentator thought that the second figure would solidify since people were now aware of the crisis and had fairly definitively taken sides. The Real Clear Politics site has some other figures and a prominent article saying that Obama faces an uphill struggle. Whether any of this bears any relationship to reality of the Congressional vote or of public opinion when the vote is taken and the die cast remains very much to be seen, I would think. Meanwhile in my own dear country a BBC poll shows a 2:1 majority supporting the anti-war House of Commons vote, not that what we think matters that much. Looking again today I found an article from a publication I haven’t read before, called AL.com, coming from Alabama (no reference to the moon). It called itself a totally unscientific poll and recorded strong opposition to a Syrian intervention. It cited a more recent ‘proper’ poll where the balance was 50:42. The next round of polls will be very interesting. Meanwhile I have the impression that Obama and McCain are on divergent tracks with one reiterating ‘It’s all going to be limited’ and the other saying ‘Remove those limits’. I must admit that I still have some sympathy with Obama. I think he was originally just trying to limit the horrors of a war that he thought would be over by now. And I’m not convinced that Assad is all that ‘innocent’ – it may be that Obama was rational in losing patience with him, though not so rational in thinking he could do anything constructive. Very latest Reuters-Ipsos – 4 hours old as I write – has 56:19 opposed. So this really will be a battle between public opinion shared by many Jewish people, of course, and pressure groups, not all Jewish, of course..
Must be Biden’s cat, because they’ve grown to look alike, have the same expression. THOSE are the questions journalists should ask. The symmetry between Biden’s mouth and the cat’s is indeed astonishing. Is Biden looking like he’s bitten on a goosegog because he wanted the Syrians blown to hell and no messing about or because he thinks the whole operation is ludicrous? 1400 people were killed by Israel in Operation Cast Lead. About 10 of them were killed by white phosphorous. (If I’m wrong, correct me.) To state: “Israel killed 1400 men women and children with white phosphorous in Gaza in 2009” is to state a falsehood. Katie Miranda, I doubt you care enough about truth to redo this cartoon to reflect the truth rather than a falsehood. I’ve been waiting for somebody in some media to say “white phosphorous” and “Gaza.” I guess it takes a fearless cat. I can only shake my head at the utter irrelevance of so many progressives, who seem to spend most of their time shrieking about non-existent monsters, when they’re not engaging in the various kinds of odd but self-congratulatory posturing that thinkers seem to excel at. Maybe it comes from having so many ideas about how the world should be, but having little power, and hence very little responsibility; and therefore not much common sense. Intellectuals of conscience especially excel at false equivalencies, the entire function of which is to escape from the moral responsibilities of the present moment. 1. Iraq was a near-genocidal disaster. Bush should be tried as a war criminal, but he won’t be, because many of our fellow Americans think he’s wonderful. But Iraq didn’t happen because of a failure of intelligence, it was a failure of an imperial president who would only listen to intelligence that told him what he wanted to hear. Syria is not Iraq. It is a completely different situation. If you view Syria through the lens of Iraq, you’re stuck in the past and are allowing yourself to be manipulated by the Iraq trauma. 2. Yes, the Israel Lobby wants a military strike on Syria for its own corrupt reasons. So what? If the people in the Israel Lobby drink water, should you stop drinking water? Grow UP, for cat sakes. 3. Yes, the neo-cons want a military strike. See number “2″ above. 4. Yes, Iran supports Hezbollah, and Hezbollah fighters are now fighting on the side of Assad. This makes a solution harder, but it has the advantage of completely discrediting Hezbollah, who until very recently were folk heroes. Every horror has a silver lining, and that may be a big one. 5. Yes, the Likudnik war criminals killed 1400 people in Gaza, 400 of them children. Only an American progressive would believe that this justifies 1400 dead Syrians. We couldn’t do anything about Cast Lead because the Israel Lobby’s control of media and political parties in America. Would you save people in Gaza? Then you must contemplate doing the same for Syrians, where something real can actually be accomplished. 6. Yes, there are extremists among the rebels, but not that many yet, and besides that’s an argument for intervention, not against it. 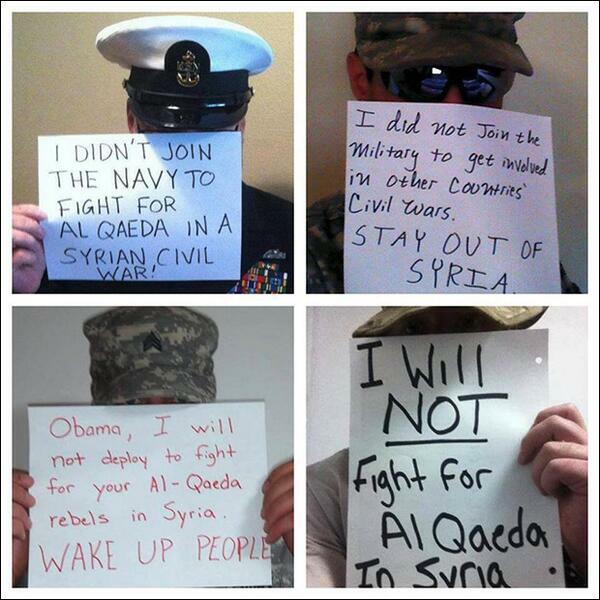 We need to stop talking about arming the Free Syrian Army, and start doing so. So what’s the real issue, as opposed to all the ghosts and phantoms that liberals and progressives are getting their knickers in a bunch over? The reality is this. Sarin gas is a game-changer. Despite what anti-intervention people are saying, killing with sarin gas isn’t the same as killing with automatic weapons. Sarin gas kills many more people, and it kills them much faster. Because it can kill 1400 civilians in a single night, and it does so in a way military units cannot defend against, it creates a complete asymmetry of power. The Free Syrian Army knows that it can’t defend against it. Assad will use it again, and if the world blinks, he will use the power that arises out of his use of mass murder. Sarin gas used for military purposes has one endgame, and that endgame is genocide. The world has both the right and the responsibility to “deter and degrade” the Syrian military. Naturally, any chance for a cease-fire should be pursued, and also a regional peace conference, but the military option will almost surely be necessary. If nobody else will do it, the Americans must, simply because they have the capability. Furthermore, the US–and its allies–have to find a way to dismantle and make safe the rather large stores of sarin gas that Assad has been collecting for decades. It simply has to be done–there’s no way to wriggle out of it. Will there be a response by Assad to the American strike? Yes, and it will most likely include a massive cyber-attack on the US. But we have to go ahead. It involves real-world risk. Deal with it. Yes, it did. I remember Powell at the UN demonstrating that “intelligence” — all bad. All lies. A complete failure. On the only metric that counts, it is not. The US has not demonstrated conclusively that it was Assad that did this. That would require, at a minimum, a full public airing of all of the sources, methods, and the content of that “intelligence” so that there can be a full discussion of the veracity of the administration’s conclusions. Absent that, then you are saying “Trust the president” which is exactly what was said in the run-up to Iraq. Bush administration had ample evidence Iraq posed ZERO threat. Is Obama any less imperial? And what lies“intelligence” is Obama listening to? Bad analogy. They harm no-one by drinking water. A strike on Syria will almost certainly harm people, and push the corrupt Israeli agenda. I’m not sure that it has discredited Hezbollah, but why would such discredit be a silver lining? Somebody already is arming them. I don’t which “we” that is. Not me, I hope. We have no reason to think that it was Assad who used it this time, and good reason to doubt it. The FSA seems a more likely culprit. The one who really rankles is John Kerry lectured about “there must be an accounting.” John Kerry came back from Vietnam opposed to the war. He knows what the U.S. did with Agent Orange in Vietnam. I was in Vietnam last year and saw an exhibit of the horrible birth defects that the Vietnamese still suffer from Agent Orange. No reparations or apology has ever been made by the U.S. for this use of chemical weapons. I wonder how Kerry’s statements about Syria played in Vietnam and Iraq which is suffering the affects of depleted uranium.